IMADA Model DI-1M torque testers are perfectly suited for n-the-spot calibration of air tools and impact drivers, but will calibrate any type of power driver as well. 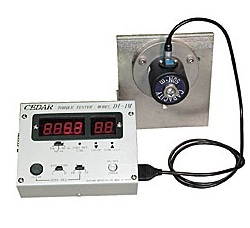 These fast response units give a digital readout of peak value in either clockwise or counterclockwise direction and also indicate the number of blows for a selected time period from 0.1 to 9.9 seconds. These instruments have an accuracy of ±0.5%, ±1 LSD and lbf-in/lbf-ft, kgf-cm/kgf-m, or N-cm/N-m units are selectable.